From Modular Site Kitchens , Grab and Go Kitchens to packed lunches we can offer many options to a busy workforce. 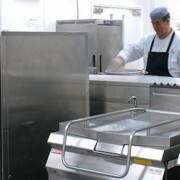 construction projects through out the UK, Express Catering are only a phone call away. We have trained chefs and enthusiastic front of house staff looking forward to an exciting year. The menu options can be quite exciting as well , from home made Steak and Ale pie to a spicy Moroccan chicken for main course, a selection of desserts can be offered as well. If you need coffee try our freshly ground range of Lavazza coffee. This will not only ensure repeat business but increase revenue for any busy construction site.